The Dread & Alive Jamaican comics | Kam-Au Amen & Co.
the founder and creative director of ZOOLOOK, a San Francisco-based new media agency established in 1996 that develops entertainment properties for the web, video, television, film and wireless entertainment. Nicholas Da Silva has been featured in Web Designer magazine HOT 100 List for the past 2 years (2008-2009). Nicholas is also an award-winning graphic designer, music producer and published author. He has developed projects for TechTV, the Beastie Boys, Charles Schwab, Wyclef Jean, Front 242, to name a few. 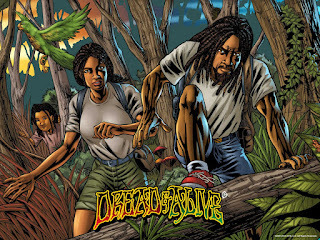 The first issue of Dread & Alive was launched on February 6, 2010 (Bob Marley's 65th earthday) in both digital and print versions. The story follows Drew McIntosh, the Roaring Lion, who confronts the evils of Babylon - illegal smugglers, human traffickers, illegal loggers (this IS fiction) among the Maroons in Jamaica's Cockpit Country. I found an unillustrated version of the story online here, feel free to flip the pages and read it for yourself. The dialog has little to no hint of Jamaican Patwa. I was somewhat disappointed there, but I recognize that we didn't write it. Follow this link if you are interested in purchasing a $0.99 digital copy for your iPod touch/iPhone. If you are going to order the print version it will cost you $4.99 plus shipping. One other fascinating thing about this project is that Mr. Da Silva will be donating 30% of all digital sales, and 10% of all print sales from Issue #1 to HELP Jamaica!, thereby assisting in the establishment of libraries and other educational projects in Jamaica. For all subsequent issues his operations will donate 10% to HELP Jamaica!, this giving back initiative is commendable. I expect there will be accusations of cultural exploitation and I'm sure that a lot of that will be tantrums of the moment. These days I know not to get too stirred by arguments in defense of opportunities that we fail to take advantage of as individuals and as a people. There is some truth to the point that very little else comes from talkers but talk. We can choose to participate or excuse ourselves, and believe it or not we have made a choice. From the days of the admonitions of Marcus Garvey, through to the present admonitions of experts, we have allowed our leadership to guide us to poor choices. These days we just live with the consequences. A point worthy of discussion is the giving back model, which I hope will likely be used by more cultural entrepreneurs to prop up the weak educational infrastructure in Jamaica. This funding approach may also force more relevance out of the national training initiatives, particularly since these entrepreneurs see the inadequacies daily. This is to be encouraged, because as Maxine Stowe has been at pains to point out, it is only by bringing in untainted investments into the creative sector that we will truly begin to see more positive output and greater returns to the Jamaican economy from the creative product. Though there are a few questions in my mind with regards to matters of representation in Dread & Alive, I will only offer up congratulations to the team at this time for taking this bold step. No matter what happens hereafter, a door has been opened. I trust that those with vision and talent will step in. Go check out Da Silva's Dread & Alive site for more information, you might find the themed music and free downloads interesting. His primary Zoolook site links to some very good work. I found that his ultrafunkular animated music mix was very entertaining. Good to see you back online man! I sense your frustration with Jamaicans who commentate / spectate rather than jump in the game. It is a well founded point that covers a spectrum of initiatives across social, political and economic life in Jamaica. Hopefully your fury will inspire us to action! Btw, I find it amusing that the cover of the comic reminds me of Avatar for some reason. Yes, I am disappointed that more Jamaicans don't jump in the game, but I wouldn't say I'm furious. Haha. It would be nice though if occurrence like these would spur more of them to action. Funny that you made the connection with Avatar. That film was an excellent piece of work. It must be a thing with these types of stories though, because I did notice that not unlike Avatar the hero comes in from the outside world to save the people. Thanks for the post. I was especially convicted by the "give back" argument. I also have a comic-book published, entitled "THE CAT". It is available at Sangster's, Craft Cottage in The Village, Bookophilia, and Coco Joe's in Ocho Rios. I will be personally promoting it at the Liguanea Art Fair this April. This volume is 98 pages long. It is also now available online at lulu.com and Amazon Kindle. Tell me how I may send you a copy and tell me what you think.